« Do you trust me? And then I may have come home from work on Tuesday with every intention of going to my dance class, which I love to pieces, but I may have been so tired from Sunday and Monday, that I crawled into bed at 6, caught up on all my TV shows I’ve been missing out on (I’m so addicted to Once Upon a Time), snacked on some Cafe Indigo Vegan Chocolate cake and went to bed early…instead of going to dance class. Prepare wheatberries according to package. I could not find mine in the bulk section of Whole Foods so I had to buy it in the bag from the grain section. To prepare, I added 1 cup of wheatberries to 1 1/2 c. of boiling water and let sit for one hour. Drain excess water (if you have any). 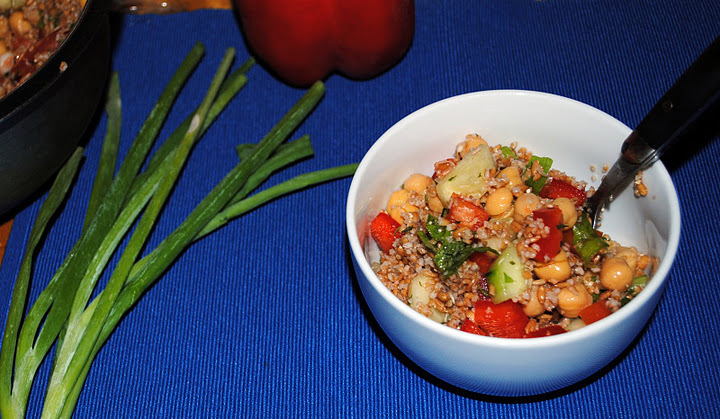 In a large bowl, mix together the diced vegetables (cucumber, red pepper, tomato, minced garlic, green onions). Add in chickpeas and stir. 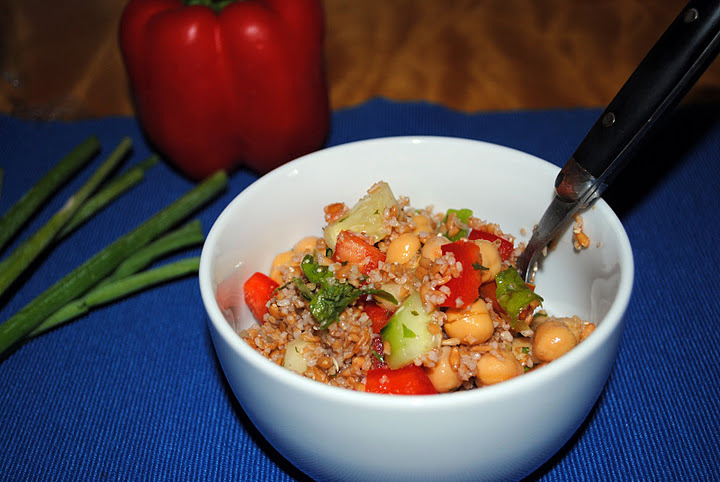 When the wheatberries are ready, stir into the salad. Add the dressing just before serving and stir well. Now season with kosher salt and freshly ground black pepper to taste. Garnish with parsley if desired. I can’t say I loved the wheatberry, though, in fairness, mine look nothing like the ones on Oh She Glows so it may have been the type I bought. 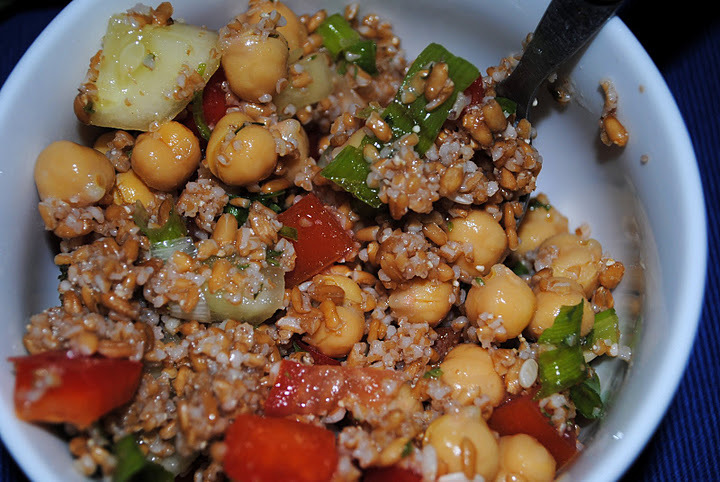 I think next go around, I’d substitute some brown basmati rice or try a different type of wheatberries. Also, this recipe called for 1 cup of fresh, chopped parsley but I couldn’t find it anywhere at the grocery store. They were all sold out. It still has a good flavor without it. It’s appropriate this salad is called “Back on Track” because after being a lazy bum all Tuesday evening, I’m seriously going to have to get back on track today!! This recipe sounds delicious. I like the touch of maple syrup in the dressing. Looks yummy! One of the recipes I’ve been dying to try is “Cowboy Caviar,” which is kind of the same idea with lots of veggies and blackbeans in a light herby dressing.